Every once in a while, security researchers try to bypass security solutions for kicks, fame, marketing and to raise awareness for a new vulnerability that totally foils protection. Microsoft’s Enhanced Mitigation Experience Toolkit (EMET) has seen its share of bypasses and when it is bypassed, the underlying approach grabs our attention. Somewhat like EMET’s philosophy, the technologies in our HitmanPro.Alert solution are also completely signatures-less, i.e. 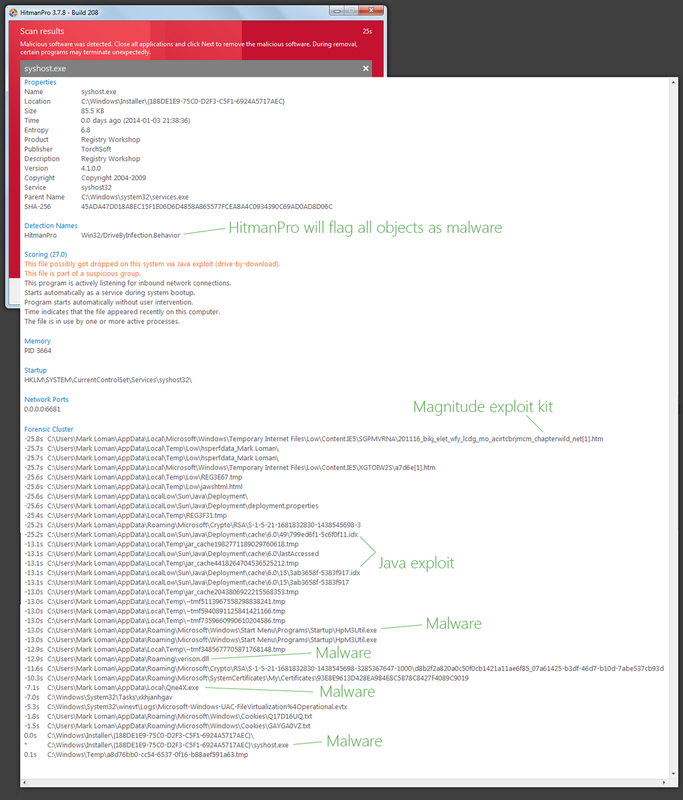 the behaviour-based anti-exploit technologies in both EMET and HitmanPro.Alert focus on the attack techniques and stop attacks without requiring threat information or signatures based on prior knowledge of attacks. For people who are unfamiliar with this terrain, some background explanation is in order; why is there a need for software like EMET or HitmanPro.Alert. To deliver malware to as many victims as possible, attackers turn to web-borne exploits that abuse vulnerable software (like Flash and Java) running on computers that visit trusted websites that contain malicious ads (malvertising) or hidden iframes that load an attack site. But did you know that there are only a two dozen techniques to abuse any vulnerability, known and unknown? And often it takes more than a year before researchers or attackers come up with a new attack technique! Did you also know that, depending on the vulnerability, always two or more techniques (like Heap Spray, Stack Pivot and Return-Oriented Programming (ROP)) must be used in sequence in order to be successful and deliver malware on victim’ machines? Software that aims to detect and block exploit techniques are e.g. 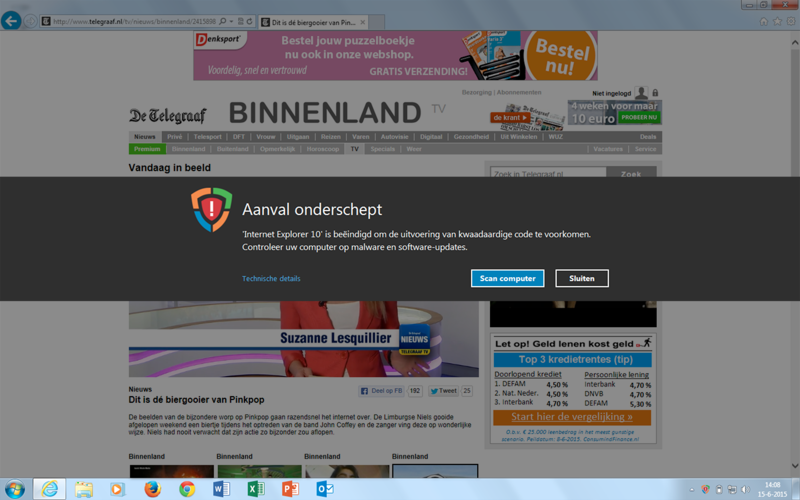 Microsoft EMET and HitmanPro.Alert. Blocking exploit techniques stops exploit attacks on existing and future vulnerabilities and prevents malware from being delivered, no matter how obfuscated, new or sophisticated this malware is. So true anti-exploit solutions that revolve around stopping the attack techniques are kind of’ the holy grail against exploit attacks and their malware. For attackers they are a formidable barrier to conquer in order to successfully compromise a pc. Last week a new technique was disclosed by Duo Security to bypass EMET’s ROP mitigations. The technique focusses on bypassing EMET’s security hooks abusing Wow64 compatibility layer. The Wow64 compatibility layer provides a 32-bit execution environment on 64-bit Windows systems. This environment allows legacy 32-bit software to run on 64-bit computers. Current exploit mitigation solutions protect the 32-bit environment. The bypass technique disclosed by Duo Security demonstrates that an attacker may also use the 64-bit environment when a 32-bit application is executed under Wow64. This effectively bypasses all security measures placed in the 32-bit environment. To read more about the bypass, see the blog of Duo Security. To get around DEP, an attacker needs to make a piece of memory on the heap executable. This piece of memory usually contains the malicious shellcode. Windows API provides functions to facilitate the modification of the protection of memory regions. For this article we focus on the NtProtectVirtualMemory function, located in ntdll.dll. HitmanPro.Alert 3.1 provides three mitigations that relate to syscall bypasses. The following figure illustrates these three attacks using syscalls. Attack #1 uses a legit syscall stub (partial) with an attacker-supplied syscall index parameter. This bypasses security hooks on the NtProtectVirtualMemory stub in 32-bit ntdll.dll. This is illustrated in the following figure. As you can see above, both syscall stubs (functions) look very similar. The only difference is the syscall index which is placed in register eax. A security solution will place a hook at the green line, the start of NtProtectVirtualMemory. If an attacker is able to resolve the address of a different syscall stub, for example NtQuerySection, it only needs to make sure eax contains the syscall index of NtProtectVirtualMemory. On this system it is 4Dh. Then by calling the address indicated by the red arrow, an attacker can mimic a call to NtProtectVirtualMemory. 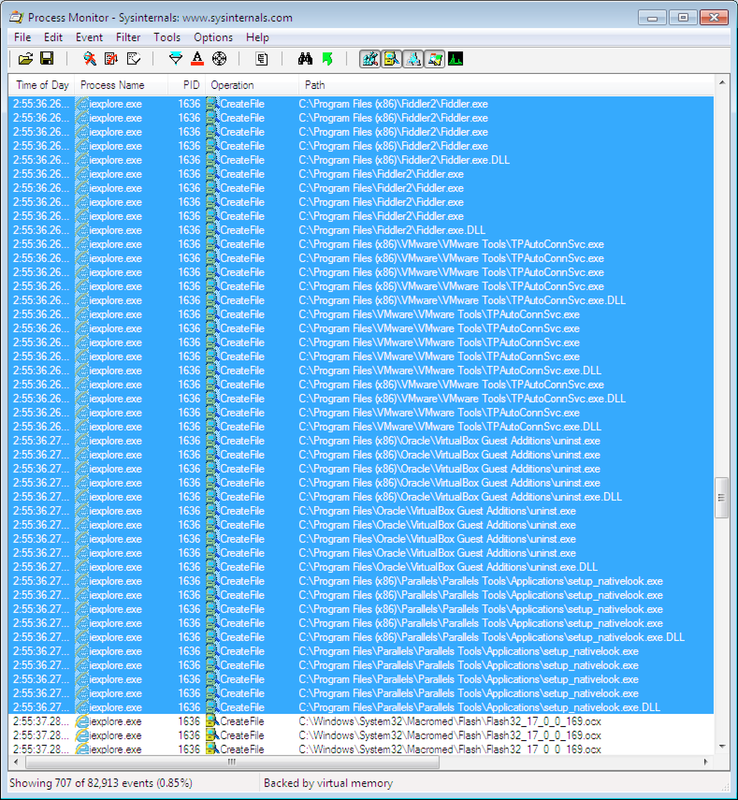 Attack #2 bypasses the 32-bit ntdll.dll entirely by directly calling the Wow64 marshalling layer performing the NtProtectVirtualMemory in 64-bit ntdll.dll. This attack is similar to the above, but now the attacker needs to resolve a function in Wow64, specifically wow64cpu!X86SwitchTo64BitMode. A pointer to this function is normally stored in fs:[0xc0]. More details on this attack can be read on this post at pastebin, referenced by @r41p41. Attack #3 is the bypass as disclosed by Duo Security. The attacker uses ROP gadgets to transition from 32-bit mode directly into 64-bit NtProtectVirtualMemory. See this paper on how this is done. The first 2 attacks are mitigated by HitmanPro.Alert 3.1 build 310 (or newer). 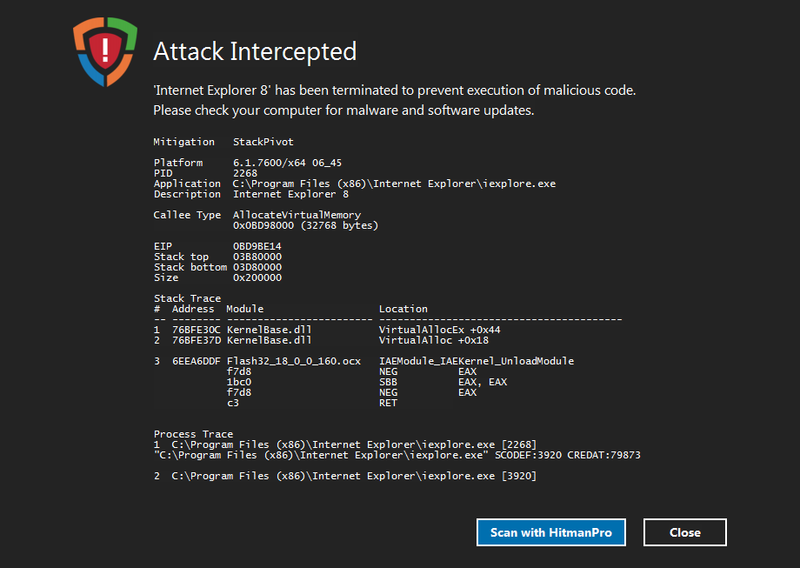 Attack #3 is mitigated by HitmanPro.Alert 3.1 build 332 (or newer). To illustrate the responsiveness of our development team, the time between disclosure by Duo Security and the release of build 332 is less than a week. Network based exploit protections are reactive based and rely heavily on signatures. Endpoint exploit mitigation solutions are behaviour-based and are not dependent on signatures. That’s why in our opinion, behaviour-based exploit technique prevention is the preferred choice. It is possible to bypass a layered behaviour-based solution, but only if an attack is entirely based on a sequence of completely new exploit techniques. However, as is shown with the new Wow64 bypass technique, the mitigation of these new techniques could quickly be incorporated into our behaviour-based solution. Which is as of then capable of mitigating all attacks (whether compressed, encrypted or otherwise obfuscated) that are based on the newly discovered exploit technique. Together with the release of HitmanPro.Alert 3.1 build 332 we also updated our Exploit Test Tool application. This application allows to safely trigger an exploit technique, including the new Wow64 bypass technique. Malware-authors create millions of new unique malware samples every year to bypass web filters and antivirus software. But did you know that every exploit attack (to deliver malware) must use the exact same techniques to exploit software vulnerabilities? And that there are only a dozen offensive techniques to make this happen? Also, did you know that depending on the vulnerability, attackers are bound to chain 2 to 5 of these techniques to even get to the stage to deliver the malware? As many of you know, our recently released HitmanPro.Alert 3 is purpose built to disrupt attackers during every stage of their attack – from exploitation to exfiltration. Instead of depending on prior knowledge of attacks (aka signatures), HitmanPro.Alert concentrates on the techniques required to exploit and compromise a computer from remote. If you are able to block attacks at the exploit stage, malware doesn’t even reach the machine in the first place. Some of the offensive techniques that help and make exploitation possible are called Heap Spray, Stack Pivot, Return-Oriented Programming (ROP) and Vtable Hijacking. Many of these techniques are necessary and chained to evade defensive technologies like DEP (Data Execution Prevention) and ASLR (Address Space Layout Randomization) that protect modern operating systems. The ability to detect and block the offensive exploit techniques in real-time puts HitmanPro.Alert in an excellent position against zero-day attacks from both nation-state attackers as well as skilled cybercriminals. But like with malware and depending on resources like skill, time and money, there are attackers that take the easy road and there are those that want or need to go the extra mile. The recent exploit attacks on CVE-2015-3113, a previously unknown vulnerability in Adobe Flash Player, is an excellent example. Discovered by FireEye and coined Operation Clandestine Wolf, this attack was crafted by a nation-state attacker they call APT3, apparently a China-based threat group. And with most discovered zero-day attacks, it didn’t take long before cybercriminals heard of it and included an attack for this vulnerability in their exploit kits, to increase the success rates of their attacks (it took them only four days as revealed by security researcher Kafeine from Malware Don’t Need Coffee). But there are significant differences between the APT3 exploit attack and the code in exploit kits that abuse CVE-2015-3113. APT3’s code is not only meticulously crafted to bypass standard defense techniques, it is also designed to evade Anti-Exploit solutions. So even though Anti-Exploit vendors blogged about the vulnerability and mentioned that their “users were already protected against this threat”, this is in fact not the case for the original APT3 variant! And this is actually true for most exploits. When you have sufficient skills and resources, even old existing exploits can be re-weaponized to evade anti-exploit solutions. This means that even though when it sounds or looks like other security solutions offer identical mitigations or layers, e.g. our Dynamic Heap Spray and Hardware-assisted Control-Flow Integrity mitigations (as well as our many Risk Reduction features) make a significant difference against well-funded attackers. But let’s discuss and compare the versions crafted by the APT3 nation-state hackers and the attack inside the Angler exploit kit. The APT3 attack employs a heap spray to facilitate arbitrary code execution. Although many Anti-Exploit solutions offer Anti-Heapspraying, few people know how most heapspray mitigations work. They simply pre-allocate memory areas often used by attackers so they cannot use these ranges to setup their heap spray. Naturally, APT3 stayed clear of these memory areas which explains why most Anti-Exploit solutions do not stop the attack with their heap spray mitigation. But it’s getting interesting when you look at how the nation-state attacker controls code execution without triggering Stack Pivot and typical ROP mitigations. In most recent Flash based exploits, the exploit hijacks the vtable of a built-in object of Adobe Flash Player, e.g. the Sound object, so that a ROP chain can be started for example via an invocation of Sound.toString(). This APT3 exploit uses a different technique to trigger its ROP chain. A custom class is defined in the ActionScript which has a method that takes a large number of parameters. The method in the custom class enables the attacker to provide ROP gadgets as parameters to the function, which results in the ROP chain ending up on the current stack! This way, there is no need for the attacker to pivot the stack to a heap location that is outside the stack range of the current thread, which would be detected by most Anti-Exploit tooling. By overwriting the function pointer so that it points to a gadget that moves the stack pointer to the beginning of the ROP chain, located on the stack, the attacker can trigger the start of the ROP chain. There are a lot (46) of ‘dummy’ gadgets (6cebb68b) on the stack which only perform a RETurn. This makes sure that stack-analysis will show a call-stack that contains ‘valid’ return addresses up to a very deep call-depth. The first non-dummy gadget (6cebb68a) pops the address 1f140100 into EAX. The following gadget performs a memory allocation, which makes a specific memory range, starting at 1f140000 on the heap executable. This range is under control of the attacker and already contains the shellcode. However, due to DEP, it is not executable (yet). 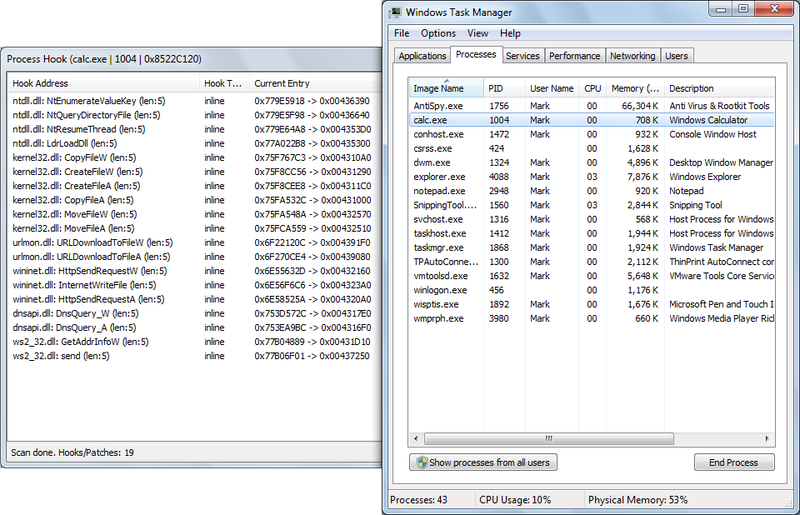 After the call to VirtualAlloc the memory is executable. This gadget, which is legitimate code located in the Flash DLL, performs a seemingly ‘valid’ call to VirtualAlloc in the way as described by Jared DeMott of Bromium, in the technical whitepaper ‘Bypassing EMET 4.1’. An Anti-Exploit tool based on stack analysis will conclude that the call to VirtualAlloc was legitimate and will not detect a ROP attack in progress at this stage. It contains 9 times the dummy gadget 6cebb68b, which only performs a ‘RET’. After that, it contains 2 times another dummy gadget (6d4b6da7). However, this gadget has the nice property that it is call-preceded. This feature makes sure that anti-exploit tooling that perform stack-based analysis will see a ‘legitimate’ return address that was seemingly placed onto the stack due to a valid call instruction. The following gadget (6cebaff0) pops the address of the call-preceded gadget (6d4b6da7) into ECX. And finally, the gadget at address 6d4b6da7 jumps to the shellcode with an indirect JMP instruction. The shellcode starts at address 1f140210. The ActionScript has placed the base address of kernel32.dll and the address of GetProcAddress into the shellcode, so that it can call this function to obtain other system functions of kernel32 without triggering anti-exploit software. One can also see that the shellcode immediately resolves the address of the function ‘SetThreadContext’. This is a very interesting function that can modify the debug register, which can disable functions that depend on them, like Microsoft EMET’s EAF mitigation. Anti-Exploit solutions that analyze the stack (which is under the control of the attacker) are fooled by the tricks deployed by the APT3 exploit. However the hardware-assisted Control-Flow Integrity feature of HitmanPro.Alert 3 reveals the ROP attack and is immune to the stack manipulations performed by this exploit. 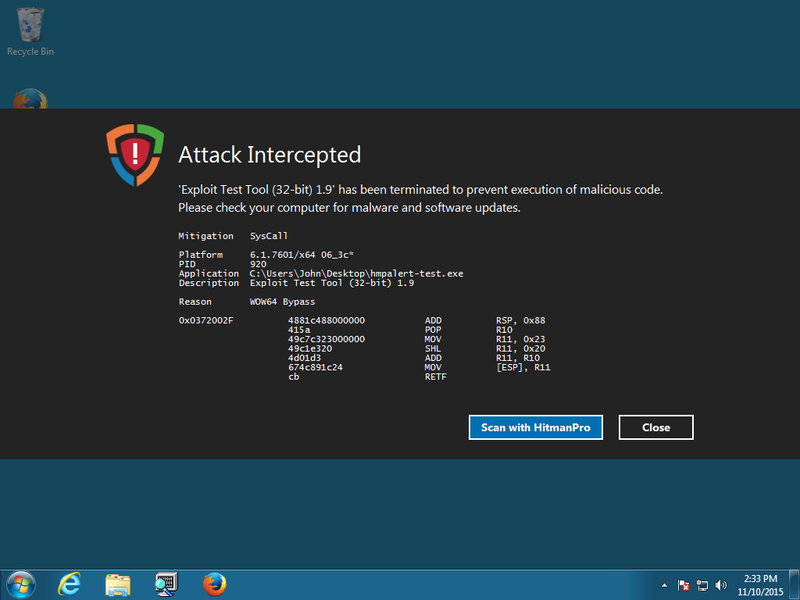 The following figure shows how HitmanPro.Alert 3 detects and blocks the ROP attack using Intel® hardware-assistance. The version used by the Angler exploit kit is different. Of course it uses the same vulnerability in Adobe Flash Player (CVE-2015-3113) to corrupt a vector on the heap to bypass ASLR, but it uses a different set of exploit techniques compared to the APT3 version. This fake object contains a pointer to its vtable at offset 0, so the vtable starts at 0857c040. If we take a look at the instructions that are located at this address, we can see that these will perform a stack pivot. But after the stack pivot, the actual ROP chain, beginning at location 0857c040, will start. The first gadget, located at 6ca9f992, will advance the stack pointer to the location behind the stack pivot gadget address. This adds 8 to skip past the stack pivot gadget which means that the stack pointer now points to 0857c04c, so the next gadget that will be executed is located at 6cac4788. EBP now points to a location that is on the current stack and lies before the current position in the ROP chain. The next gadget in line starts at address 6cc334a6 which swaps the contents of EDI and EAX. Now the following gadget that will execute is the one that will make the contained shellcode executable (DEP bypass). It starts at address 6d096dd9. This gadget, which is legitimate code located in the Flash DLL, performs a seemingly valid call to VirtualAlloc in the way as described by Jared DeMott of Bromium, in the technical whitepaper Bypassing EMET 4.1. When the allocation returns, it falls directly into the shellcode at address 0857c06c. The shellcode is located on the heap directly after the ROP chain, starting at location 857c06c. APT3’s attack on CVE-2015-3113 doesn’t perform a stack pivot as the gadgets are placed on the current stack. In addition, it never falls directly onto critical functions or shellcode and uses return addresses that seem legitimate to foil Anti-Exploit heuristics. Compared, the techniques that are used in the Angler exploit kit are rather straightforward and will be detected and blocked by most (commercial) Anti-Exploit tools. While evaluating both attacks I can’t help but think that APT3’s zero-day attack on CVE-2015-3113 is proofing the same point that we tried to convey and demonstrated with our example attack on an artificial zero-day vulnerability in Firefox 29.0, for MRG Effitas’ Real World Exploit Prevention Test (March 2015). Some people said it was unfair and unrealistic that MRG Effitas included our special crafted version in their test, but it turns out we did not have to wait long before a skilled attacker proofed our point as well: with enough time, effort and money, a knowledgable attacker can bypass Anti-Exploit solutions. But with unique features like our Hardware-assisted Control-Flow Integrity, HitmanPro.Alert raises the bar to new heights by further increasing the attacker’s costs, in effect avoiding future system compromise and reducing business disruption. 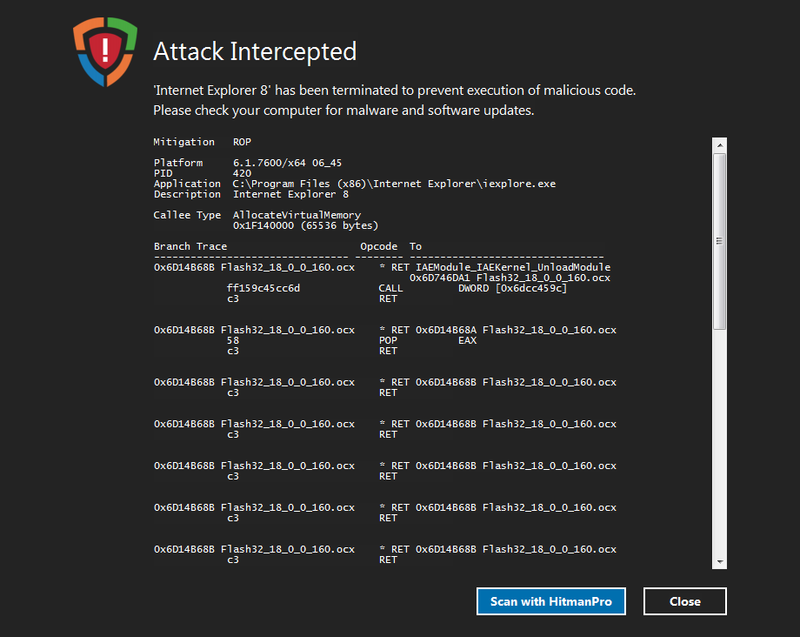 Users running HitmanPro.Alert 3 are and were already protected against both the nation-state version as well as the exploit kit version of the attack on CVE-2015-3113. As expected, Microsoft isn’t offering their MS10-046 patch for the critical Windows Shell shortcut vulnerability to users of Windows 2000, XP RTM, SP1 and SP2. We think that 14,45% is quite a significant number of users that are left out in the cold by the software giant. In Hitman Pro 3.5.6 build 109 we introduced a universal detection method for the shortcut vulnerability. We could not simply rely on checking the version number of shell32.dll as there are simply too many different versions. To complicate things, 64-bit Windows also have WoW64 versions of shell32.dll. The universal detection method works by trying to trigger the actual exploit. This ensures that the LNK Exploit Protection is not offered to users that either installed MS10-046 or custom patched their shell32.dll. (Note: The custom patch seems to work on some specifc versions of shell32.dll only). We recommend Windows XP pre-SP3 users to upgrade to SP3 for best protection against the exploit. But if you are stuck with Windows 2000 or you are unable to upgrade to XP SP3 then you can use Hitman Pro LNK Exploit Protection to protect your computer from malware that is currently exploiting the critical shortcut vulnerability. 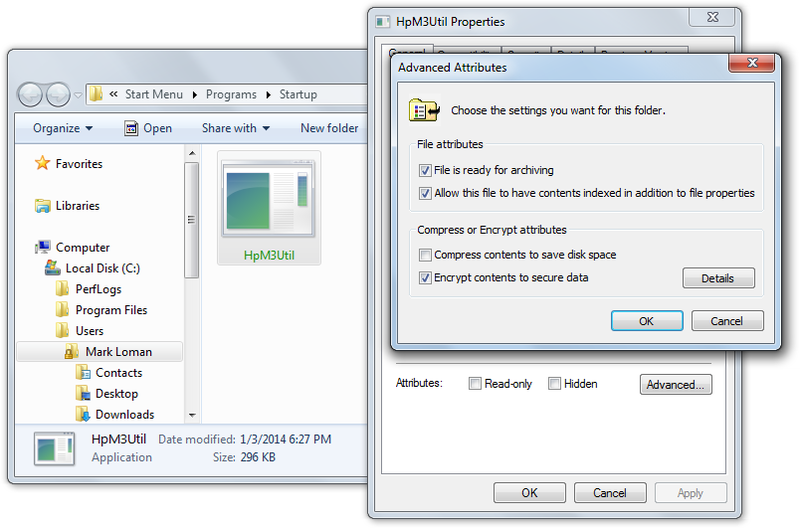 We have been contacted by a few people that asked how the Hitman Pro LNK Exploit Protection works. Well here it is. 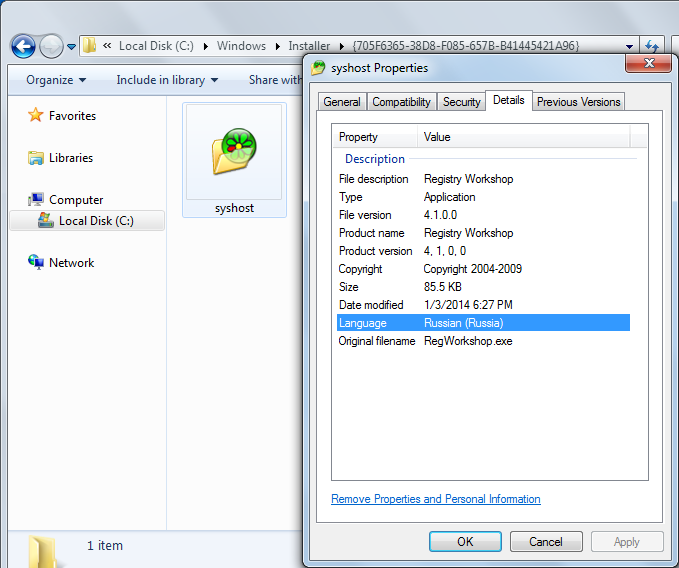 The vulnerability is in the Window Shell component shell32.dll. This library is responsible for parsing shortcuts (.LNK files) and their icons (see IExtractIcon). Certain special shortcuts specify that their icon resides in a separate library file and the shell32.dll uses the LoadLibraryW function in kernel32.dll to load that icon library file. Now the LoadLibraryW function reads the icon library file with execute rights and it calls the icon library’s DllMain function. Hence, it executes (possibly malicious) code while trying to fetch icon data! Normally icon libraries do not have a DllMain or even hold code, but malware trying to exploit the vulnerability do. So in order to provide proper protection for the exploit, we need to prevent the use of LoadLibraryW when shell32.dll is reading an icon from a library file. The Hitman Pro LNK Exploit Protection Shell Extension intercepts the LoadLibraryW function (using an API hook) when shell32.dll tries to load the icon library file. The intercept replaces the LoadLibraryW call with a function that loads the library as a data file. Reading the library as a data file ensures that the library’s DllMain is not called, meaning no code is executed while reading the icon. This is how shell32.dll SHOULD have read the icon from a library file. The intercept of the LoadLibraryW function (while reading the icon library file) is a very elegant solution. It works very transparent for the user and it works across the entire system. Other vendors perform PIDL filtering (example code here) in an effort to block malicious shortcuts. While effective, it also blocks non-malicious shortcuts (like VPN shortcuts). The real vulnerability is the use of the wrong function to load the icon’s library file, not in the use of specific PIDLs. 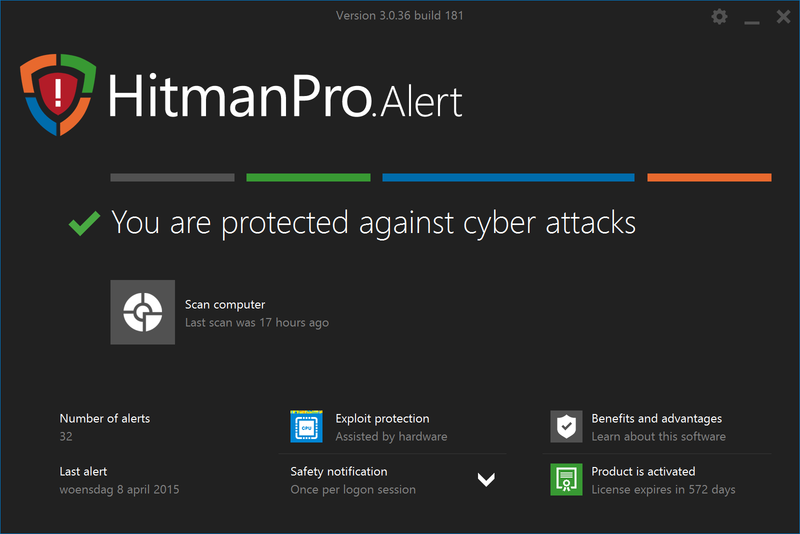 Until Microsoft provides a patch, Hitman Pro offers the user to protect their computer from the exploit. Since we do not know yet how to recognize Microsoft’s patch we will roll-out an update when Microsoft starts pushing its patch for the vulnerability. The Hitman Pro update will then detect the patch and disable the LNK Exploit Protection Shell Extension. It has been over 2 weeks since Microsoft’s confirmed a serious vulnerability in the handling of Windows shortcuts. At least 5 different pieces of malware have already jumped on the bandwagon and began actively exploiting the vulnerability. There is still no official patch, presumably since every Windows version (including 64-bit) is affected and it takes time to develop and test a fix for all these versions. Notice that Windows 2000, Windows XP RTM, SP1 and SP2 won’t seem to be getting an update as these products aren’t listed in Microsoft’s advisory. But these older versions are vulnerable too! The vulnerability is in the handling of reading icons for shortcuts (.lnk files). A special shortcut can specify to load the icon from a separate library file. The Windows Shell (SHELL32.dll) loads that library file with EXECUTE rights, causing (potentially malicious) code in that library file to run. 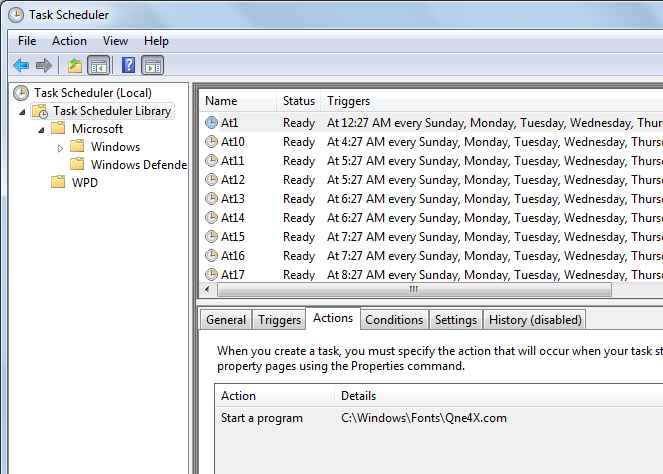 Notice that Windows does this automatically, no user interaction required! A few AV companies have released standalone tools, but these tools either offer protection of non-local disks only or they also block some legitimate shortcuts. Though these solutions are better than Microsoft’s workaround where all shortcuts lose their icon! Today we have released, as part of Hitman Pro, the LNK Exploit Protection Shell Extension. This extension prevents the vulnerability in SHELL32 to load the icon library with execute rights. The result is that the icon is still loaded but no (potentially malicious) code is run. This works on the entire computer (not just on non-local disks) and it does not block the icon of legitimate shortcuts. More information on the exploit can be read here. The following video illustrates how to enable and disable the LNK Exploit Protection feature. Note: The LNK Protection provides protecton of malware exploiting the vulnerability only. You are currently browsing the archives for the Exploit category.